Most of the time, it's best to choose a plain fabric to embroider on. Unless they are subtle, printed designs on the fabric can be distracting when stitching a pattern over them. However, if you use the elements printed on the fabric as a guide for your embroidery, you'll end up with something truly special! The key to this is embroidering over a printed design and using that design to inspire your stitching. In fact, the embroidery should become an extension of the fabric, enhancing and embellishing what is already there. Almost any printed cotton fabric works with this technique, and because there are so many designs to choose from, each time you try this, it will be unique. That's part of the charm! Some fabrics have patterns that seem to call out for an obvious embroidery addition. For example, those with an embroidery-inspired design. Or, you might add rows of stitches to striped fabric, or embroider lazy daisy petals around tiny polka dots. Paisley and floral fabrics often have large or detailed designs, offering plenty of opportunities to embroider over the "pattern" provided. When it comes to stitching on printed fabrics, there's so much room for creativity. Take a look at a few ways to create and use your embellished material. An easy place to start when stitching on your printed fabric is to look for outlines. These will be exactly like the lines you would transfer on a standard pattern, so they are a natural for embroidery. 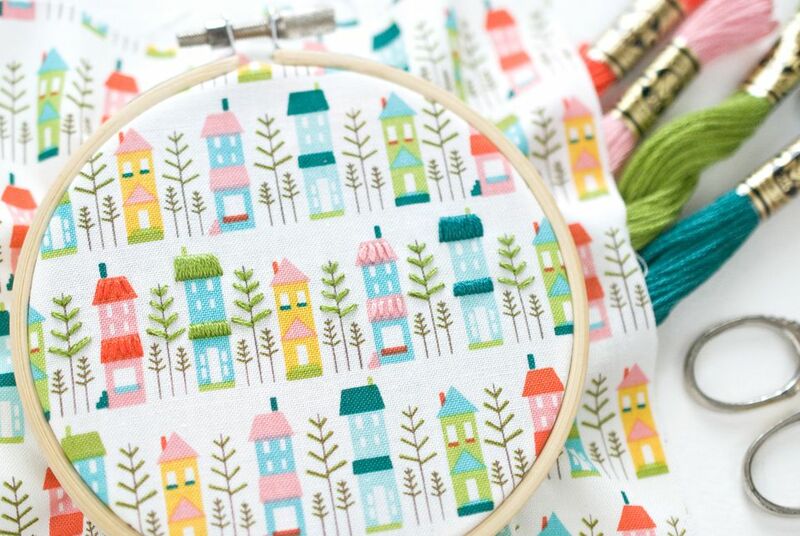 On this house fabric, for example, use straight stitch branches on the large trees. Another option would be to stitch down the middle of the tree as well as embroidering the small trees. In this case, some of the fabric still shows, creating some contrast. And that's something to consider. Do you want a lot of fabric showing? Or do you want to fill it in as much as possible? Either one is okay! The other thing you can do is select one area in a larger piece of fabric and only embroider over that area. In the fabric above, the embroidery is only over one row of houses and trees. Solid printed areas also make a perfect base for your stitches. Try embroidering a design within the area or stitch over the entire space as fill stitching. For the roofs of houses like these, try working a few straight stitches to look like little ridges. On others, work satin stitch over the entire roof for a more solid look. The texture of both of these options enhances the design that's already there. This is only one example to get you started. Use your favorite stitches and create a design you like in just about any filled area of printing. Now you can use the embroidered fabric for small sewing projects or framed in a hoop to show off both the fabric and stitching! Give your printed fabric some stitching stability by ironing stabilizer to the back. Try different types of stitches and choose stitches that both mimic and contrast with the fabric designs. Think about your embroidery as paint-by-number and match the floss to the printing. Look for ways to use embroidery floss colors that contrast with the printed fabric in bold or subtle ways. Depending on how you want to use the embroidered fabric, you may want to use fewer strands of floss so the embroidery doesn't become too thick.